The Healthy Streets Approach is a new framework which places human health and experience at the heart of future planning in London. 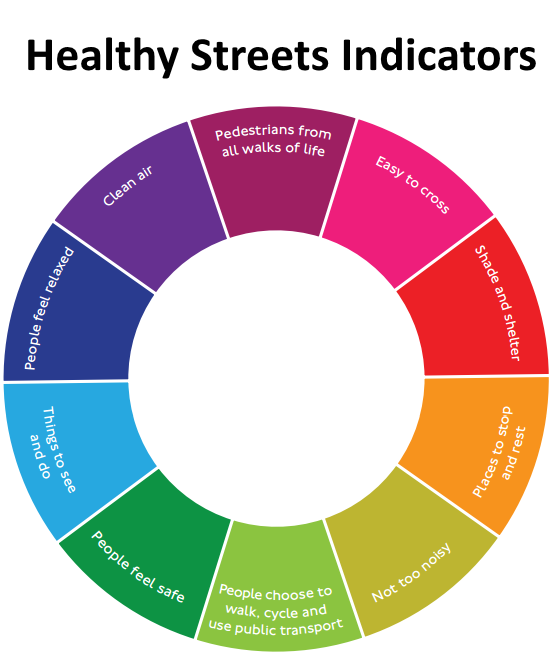 The Mayor published a document on his Healthy Streets agenda -'Healthy Streets for London' - which explains the key themes and why he feels it is necessary - you can read this document here. You can also visit TfL's website to find out more about the Mayor's Healthy Streets approach here. Given that London’s boroughs are responsible for 95 per cent of the capital’s roads, they are key to delivering the Healthy Streets agenda in London. The boroughs do a lot of excellent work in supporting this type of work already, for example installing green infrastructure, improving the accessibility of their streets, and encouraging cycling and walking. London Councils’ works to help authorities in this area includes working with the Mayor of London and his Walking and Cycling Commissioner, Transport for London (TfL) and other key stakeholders. We recently responded to the draft Mayor's Transport Strategy which included the Healthy Streets Approach. In this response we strongly support the focus on making London a city where people choose to walk and cycle. You can get more information and view our full response to the draft MTS here.